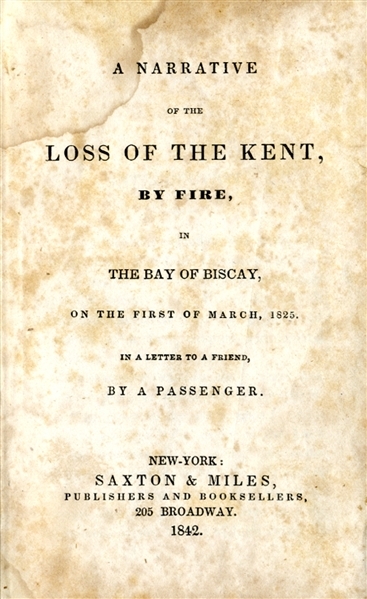 Book, 4” x 6”, “A Narrative of the Loss of the Kent East, by Fire, in the bay of Biscay, on the 1st March, 1825. In a Letter to a Friend. By a Passenger, 68pp., VG. he Kent, Captain Cobb, had made two voyages to India in the early 1820s and in 1825 embarked on a third carrying the 31 st Regiment of Foot to Bengal. On 25 March the ship caught fire in the Bay of Biscay in a heavy storm, and most of the crew and passengers would have been lost if not for the timely arrival of one Captain Cook on the Cambria; in the event, most survived, and were carried on board the Cambria before the explosion of the Kent early the following morning.This account was published anonymously but was later attributed to Sir Duncan Macgregor. The account was very popular, with four editions appearing within the first twelve months or so; any is uncommon, particularly this first, and particularly in the original boards.